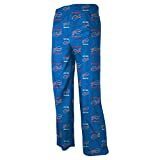 Your child can stay comfy around the house while supporting your team in these pajama pants from Outerstuff. Features all over printed team logos, elastic waistband, machine washable, and made of 100% polyester. Officially licensed. This entry was posted in Sports Kits and tagged Bills, Buffalo, Logo, Pajama, Pants, Youth by All Kits. Bookmark the permalink.